The broken itty bitty greenhouse was finally dismantled last week. Before it came down though a few flats of lettuce and spinach starts peeked through the mess. As if to add insult to injury, one afternoon I looked out the window to see both cats enjoying the comfort of these seedlings in the afternoon sun. Last week on a pretty day, with ground too wet to transplant in, Milan and I transplanted these seedlings into big plastic pots we had laying around. 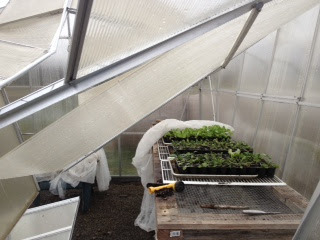 Without greenhouse protection, we'll see how many of these make it through this week's cold nights.